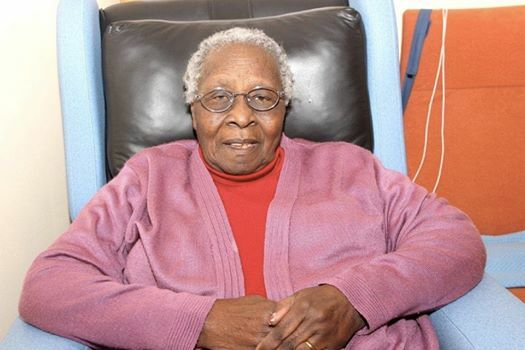 Rosemary Karuga is nearly 90 years old. But Kenya’s most senior woman artist is still going strong. She lives abroad with her daughter, but she’s still creating the art form for which she’s renowned, a painterly style of paper collage. Rosemary was recently named ‘Artist of the month’ by the National Museums of Kenya’. Coincidentally, she’s called a ‘Master Collage Artist’ by Red Hill Gallery where her first solo exhibition in years just opened, running through December 3rd. 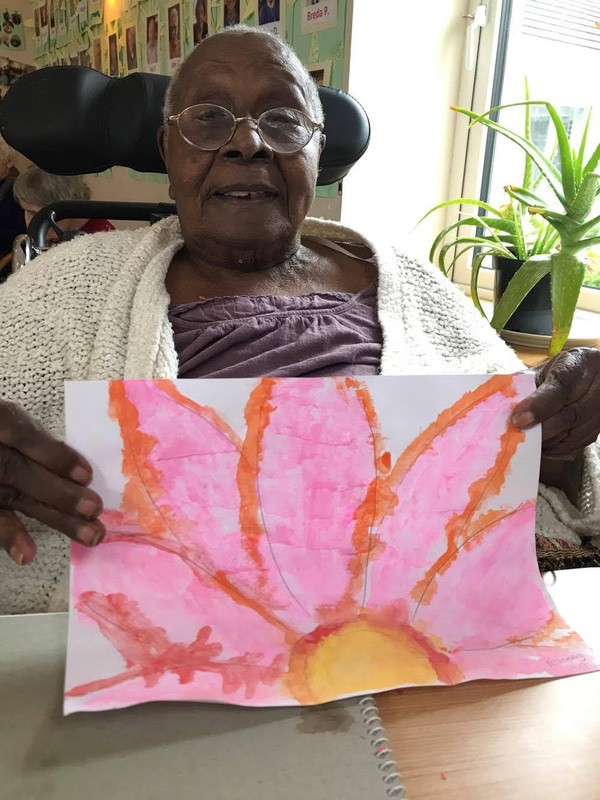 Being Kenya’s first woman artist to study at Makerere University’s Margaret Trowell School of Fine Art [from 1950-52], Rosemary is a living legend. But she didn’t come into her own professionally until the 1980s after she’d retired from teaching art in local primary schools. At Makerere, she’d specialized in sculpture but once she got married and returned to Kenya, there were no funds for a kiln so her art had to go on hold. Then by the time she was ready to get back to work, she still lacked the funds to buy the art materials she required. That’s how Rosemary began creating collage art, using the paper packaging from Rexona soap and Unga flour. But even using those basic colors, the skill, beauty and imagination of her art was apparent. Having been a classmate of Paa ya Paa’s Elimo Njau at Makerere, Rosemary got back on her artistic ‘feet’ taking up a four-month artist’s residency at Paa ya Paa with the Njaus. Recalling how Rosemary found her way back into Elimo’s life, Phillda Njau explained that in 1987, the long-lost artist magically reappeared right when Paa ya Paa was planning a ‘Women in Art in East Africa” exhibition with Goethe Institute. “Rosemary said she wanted to come back into the local art world, so her timing was perfect,” Phillda said. “It was after that show that Rosemary worked as an artist-in-residency at Paa ya Paa for several months,” she added. 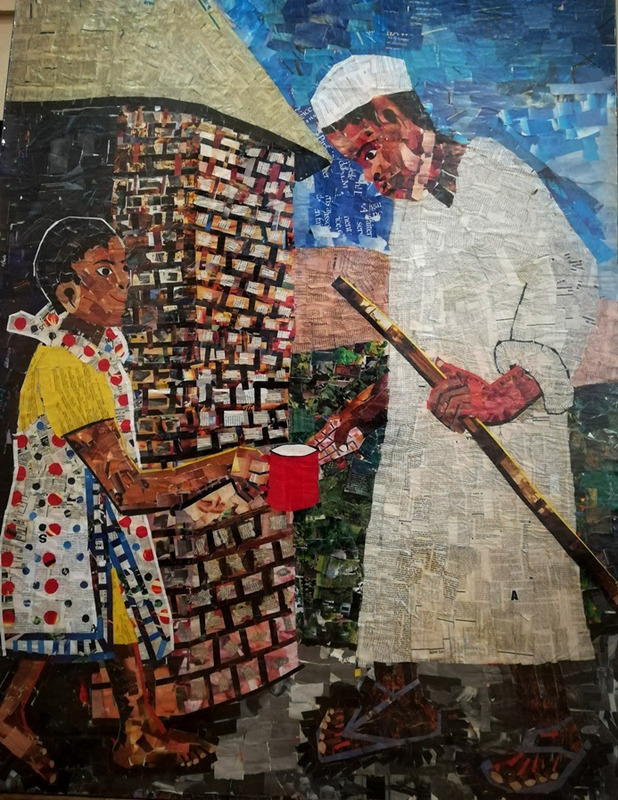 In a radio interview with the BBC Art House, Rosemary explained she’d been commissioned in 1990s to illustrate Amos Tutuola’s magical book, ‘The Palm Wine Drinker’ which subsequently led to her collage ‘illustrations’ being exhibited in Paris, then in London and later in the Studio Museum in Harlem, USA. The Paris exhibition included a trip to France for Rosemary who told BBC how much she was impressed by Parisians who were highly appreciative of fine art and who also honored the artists. She added it wasn’t that way in Kenya where her international reputation didn’t put bread on her table. That is how, when times were tough, she ended up selling her collages ‘for a song’ to Sarang Gallery. Over time, Sarang’s Mahindra Shah acquired a good number of her works, quite a few of which are in the Red Hill show. The rest are either on loan from the National Museum or from the Rossler-Musch’s private collection. Rosemary wasn’t able to attend her exhibition opening. 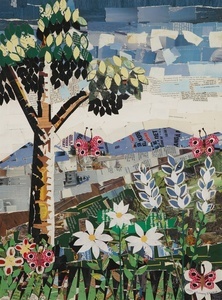 But what stands out in her collage art is both the delicacy of her attention to detail and her appreciation of rural life. She create collage ‘paintings’ of everyone from shephards and water or wood carriers to farmers, families, landscapes and wildlife. 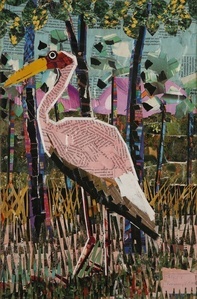 Still ‘painting’ with colored papers which are now carefully cut from glossy magazines (not Unga sacks), her collage art has a sweet feeling of almost childlike naivete. But her nuanced approach to color shading with finely shredded and carefully glued lines makes her collages look almost impressionistic and certainly worthy of the kind of honor that Rosemary saw Parisians give to their favorite painters, be it Renoir, Degas or Picasso. 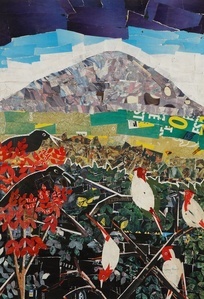 Currently, the National Museum is said to own quite a few more Rosemary Karuga collages. One hopes that in future the Museum can bring out all those precious collage ‘paintings’ by Rosemary and give them a permanent pride of place for the world to see. For if there is one Kenyan artist who deserves to be recognized and even awarded by this country for her contribution to contemporary Kenyan art, it is Rosemary. And she deserves it now, in her lifetime.